Chief executive Sandra Laurenson retires today after almost 44 years at Lerwick Harbour. WHEN Lerwick Port Authority chief executive Sandra Laurenson shuts down her desktop computer later this afternoon (Friday) she will do so for the last time after having spent the day saying her goodbyes to friends and colleagues. 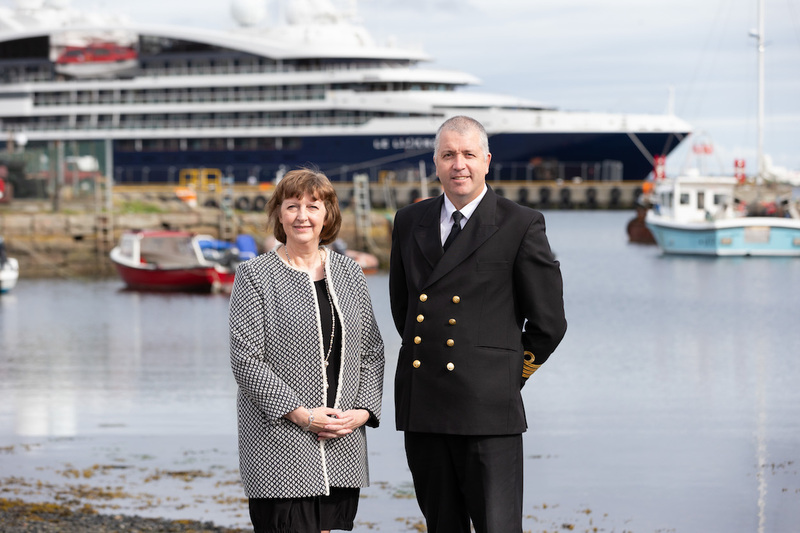 After almost 44 years at the port authority – formerly known as the Lerwick Harbour Trust – Laurenson has chosen her 60th birthday to leave it all behind and enjoy a much deserved retirement. Captain Calum Grains will take over the helm at the port authority on Monday as he moves into the head office with its adjacent boardroom, overlooking the town and harbour. He says he is looking forward to the challenge but freely admits that it will be a hard act to follow. Following a summer job as a 15-year-old back in 1974, Laurenson knew a career in a busy harbour office was exactly what she wanted. A few months later, and once she was old enough to hold a full-time job, she started her working life in the port’s accountancy department. She became the office’s administration manager before being made deputy general manager in 1998, a year before Lerwick Harbour Trust became Lerwick Port Authority. Nine years later, she was appointed as one of the first female chief executives of a port authority in the UK following her predecessor Allan Wishart’s retirement in 2007. Laurenson joined the port at the height of the oil industry boom that changed Shetland forever. She initially witnessed and later directed the port to become the modern and forward-looking organisation that it now is. “When I started working full-time the port was really busy with oil and gas, with exploration and offshore supplies,” she said. Opening the £16.5m Mair’s Pier project last summer was one of the highlights during her tenure as the port’s chief executive. From left to right: Shetland MSP Tavish Scott, port chairman Brian Anderson and chief executive Sandra Laurenson. In those heady boom days oil and gas activity accounted for as much as two thirds of port traffic (and income). Today oil and gas still play a significant part in the business but other sectors such as fishing, but also the lifeline ferry service and, increasingly, the cruise liners visiting the harbour, have gained in importance. The eighties saw the arrival of the large fleet of East European factory ships buying up and processing pelagic fish. 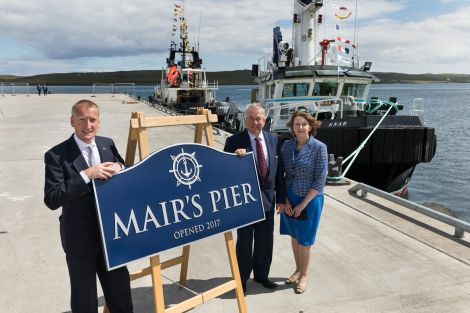 This led to the port and fishing industry partners responding by building its own pelagic factory, Shetland Catch, to capitalise on increased landings of herring and mackerel. Shetland Catch was modernised back in 2002 and is today majority owned by the Norwegian seafood multinational Pelagia. Between 50,000 and 60,000 tonnes of fish are being landed at Lerwick every year, most of it pelagic – but whitefish landings have been the real growth sector in recent years. However, without the occasional upturn in oil and gas exploration, the port authority would not have been able to make all those vital infrastructure investments such as the new Mair’s pier and quay, the Dales Voe decommissioning base and the new fish market that is currently being built. And there are other big investments on the horizon, such as the ultra deep-water quay proposed for Dales Voe, a redevelopment of the Arlanda area, and a deep water quay for large cruise liners in the centre of town – projects that will be on Capt Grains ‘to do list’ as he gets a handle on his new job. It is clear that Laurenson takes a lot of pride in handing over the port in prime condition, but is far too modest to admit to it. Working with at the port authority has been “hugely interesting”, she said, adding that “a good bunch of colleagues” had made Albert Building an “enjoyable place to work”. Similar to Laurenson, her successor can also be described as homegrown. Grains joined the port authority as a harbour pilot in 1997 and was promoted to harbourmaster in 2007, and deputy chief executive a few years later. As part of carefully managed in-house succession planning, he has been working alongside Laurenson for a number of years to learn the ropes. He says he is delighted to have now been given the opportunity to follow in her footsteps. And that challenge comprises of: finding a response to the current downturn in oil industry activity, the uncertainties of Brexit and its likely impact on the fishing and fish processing industries, the freight links bottleneck as well as the tendering process for the lifeline ferries. Laurenson’s advice, though, is clear. “I think you have to not just stay in your own patch, you have to go out to where your market is, because a lot of our trade is coming from outside of Shetland, and that is money that we are re-investing in Shetland,” she said.